The week started off with damaging gale force winds. The Yurt tried to take off, the henhouse blew over, branches broke off and at least half of the cherry crop was lost. It was not until the next day when I was in the full swing of multi-tasking in my workshop that I had a powercut that lasted for several hours. This curtailed Fergus’ electric guitar lesson and Fenella’s internet based homework. Of course, this was nothing compared to the devastating tornado that killed so many people in Joplin, Missouri USA. Somehow I was “in the creative zone” this week and flitted between several projects. I added some shot cotton bits to an African fabric panel which I may treat like a wholecloth. I appliquéd a Celtic knotwork twin for one of the Stunt Quilter’s Yurt panels. Adding the black bias was really fiddly so I don’t think it is a technique that I would rush to repeat. I intend to mark on some fancy trapunto like the original and see if Lenni will enable me to quilt bravely and smoothly around a drawn design. I worked on Ellen’s diamonds quilt. She had been given a Spanish fabric kit that contained linen, velvet and damask and since the diamonds were all cut on the bias, the resulting quilt top was very stretchy. 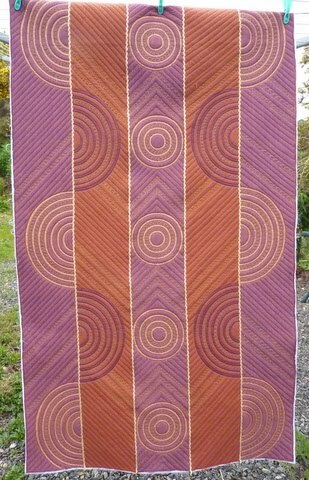 It would have been very challenging to quilt this on a domestic machine so I insisted that I would longarm it instead. I used wool for warmth and also to take up a bit of the fullness. Ellen commented that this lifted a feeling of guilt that she had kept putting off finishing that particular project. I also worked on the Celtic Drunkards Path panel and was pleased with my first attempts at curved cross hatching using boomerang shaped rulers. As a reward for all of this industry, I “allowed” myself to piece the African Fabric Shop wall hanging kit that I bought at LLQS. I even spent some time trying to finish drafting the remaining Yurt Book projects. I want to produce a very rough draft so that potential publishers can see exactly what I have in mind. It was a busier than usual week for the children; Fergus passed his cycling proficiency test and Freya packed for her school trip to France. I spent a fraught Saturday with Fenella “assisting” with her homework to produce a realistic model pirate ship. I think it is really tricky using junk to make a boat so that it does not look like a shoebox covered in paint and sellotape. We both lost our tempers but the final result looks shipshape; at least, my linen sails hand sewn onto the lollystick masts look pretty authentic. 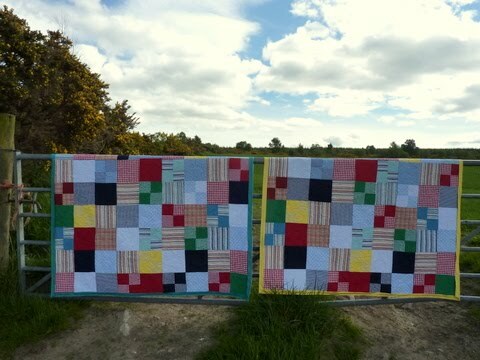 I tackled a pair of boys’ quilts almost as soon as the customer dropped them off as I knew that if I left them any longer they may not get fitted in for ages. They were really charming in simple checks, spots and stripes and big swirls finished them off really well. I decided to trace the Celtic knotwork Yurt panel from California and make a second version of it for Yurt 2. My curved cross hatching rulers have now arrived so I hope to tackle the Celtic Rings next. 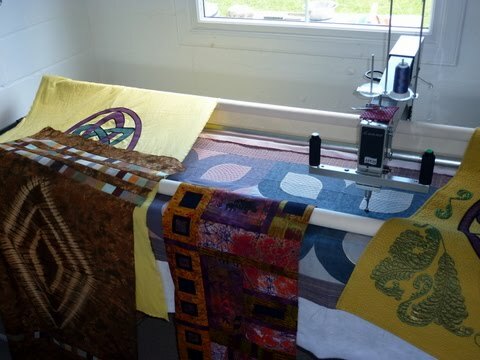 I will have to make a decision on when to stop as it is probably about time to work on a new project or at least think about a couple of new competition quilts. I checked and edited the supply list for my AQS classes at Des Moines, and submitted the draft book proposal so it really was a week of crossing things off lists. It was an incredibly sociable week. I attended the world premiere of low budget comedy-horror film, “Attack of the Herbals”. This was shot entirely on location near Stonehaven with local actors. The bizarre plot involved herbal tea that made the villagers psychotic and turned them into evil zombies. It was surprisingly funny – apparently it has attracted considerable interest at the Cannes Film Festival. I took Freya and Fergus out for a sophisticated supper at Woodend Barn to see Walter Strauss, an amazing guitarist from California. He played a mixture of Blues, Spanish, American Folk and African instrumentals, including songs that he had written himself. We also went to see Pirates of the Caribbean 4 and enjoyed the swash-buckling piratical adventures of Captain Jack and the dastardly BlackBeard. In addition to all of the cultural outings, there were some incredible cultures bubbling away at home. My sourdough starter no longer smelled like vomit, just acridly cheesy. I appealed for help on the River Cottage Forum and was advised to keep going as the cooler climate in Scotland was obviously slowing down its fermentation and at least it was not mouldy. Sure enough, it now smells fresh and yeasty after two weeks so I hope it actually makes good bread! We had some remedial work done on our old fashioned concrete septic tank and soakaway; I was complimented by the digger driver that he had not seen such wonderfully healthy bugs and cultures for years so it’s good to know that we have done our bit for the environment. I spent Friday and Saturday at the Loch Lomond Quilt Show with Ellen. We spend a pleasurable and leisurely couple of days visiting all of the exhibitions. 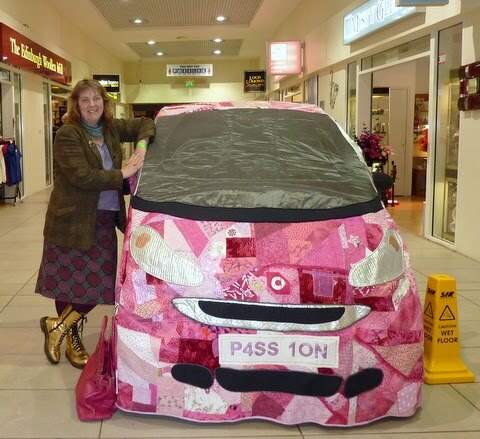 The Smart Car looked great in the shopping centre at Lomond Shores. The Canadian Red Cross Quilts all had moving stories to tell. 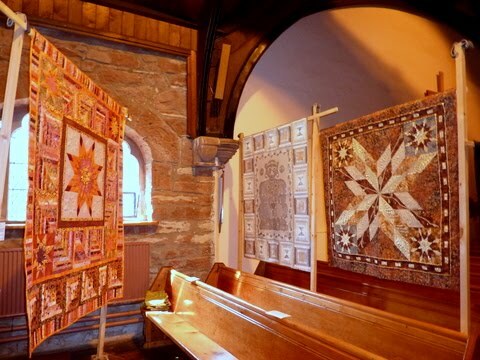 Of course I am biased as some of my quilts were there, but I particularly enjoyed the “30 of the Best” and “FreeWheeling” galleries in the Trinity Church at Renton. The traders were in a new, brighter location at Riverside Church and I bought some gorgeous African fabrics from Magie Relph’s African Fabric Shop. There are a couple of large pieces that may end up as Yurt panels and a wall-hanging kit for me to do just for fun. It was lovely to catch up with so many people and even be recognised by my gold boots. I am also thrilled to mention that I have sold “LSD” as part of my effort to raise funds for the Yurt tour of the USA. Its new owners are from Australia; they were on holiday in the UK and were visiting the show. This will be my most well travelled quilt as it has already been to California and Rhode Island. I will be kind of sad to see it go but on the other hand, it’s an excuse to make something new! I worked on a geometric Yurt panel this week which I have called 5 Bar Gate. It is a very basic strip quilt with vaguely Welsh/Amish inspired quilting. Simple designs can be surprisingly time consuming as the lines have to be drawn out accurately then followed with a ruler with concentration. Some of the lines were then filled with mini spirals. I was really pleased with the effect and decided to order a couple of new rulers. I did not have one that was marked for cross hatching so I drew the lines in fine marker pen then scratched them on using the point of a pair of compasses. I spent Friday 13th painting inside the quarter inch lines with a very small paintbrush while listening to Radio 4. Earlier in the week someone told me that I sounded “just like Sandi Toksvig!” Hmm, I have always wanted to be a BBC presenter… While listening to the R4 soap opera about farming, The Archers, I dutifully filed my Government guidelines on what to do if I have an outbreak of Sheep Scab with my flock inventory. I applied for an agricultural holding number several years ago in case I ever wanted to get a couple of pet goats but I have never actually had an Ovine on the property. Theoretically this means I could keep sheep, llamas, pigs and even elephants. At the moment the only “livestock” to keep me occupied when I am not quilting are my 5 hens. I spent an interesting day with Garioch Quilters on Tuesday where I taught my feathered Paisley class. I made notes on what could be improved for future classes. I will include a photocopy or template for people who really don’t want to draw their own designs and I need to source white-board pens that don’t trigger asthma. I even went home with some fresh rhubarb. This went straight into a cake that was delicious, despite getting burnt on one side. I left a curry in the oven at 120 degrees while I took the children swimming but when I got home it was black. I will attempt to change the thermostat since I refuse to buy a new cooker until the day I finally get an Aga! Fenella kept me busy with “homework” so I sub-contracted some of it to her older sister who created a pirate outfit, drew on some fake tattoos and took photos for the class project. I felt inspired to make a sourdough starter for yeastless bread. It has to be fed with flour daily for at least a week until it gives off a pleasant yeasty odour; however, it smells more like vomit to me so I am hopeful things will improve. I caught up with Mo who had cut out lots of foliage for a Green Man appliqué project which should look great. 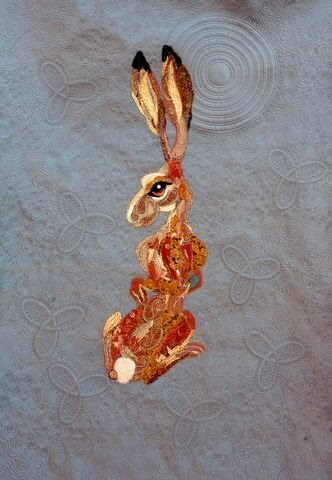 She has given me the challenge of quilting some intricate Celtic stencils to make new borders for the Hare. She also produced a sketch of an adder that we could piece or appliqué so it looks like I will have plenty of panels left in the UK for Yurt 2 after the original ones are shipped to the USA later this year. I made myself sit and concentrate on the Yurt Book for a whole day without getting side-tracked. Once I got started I made good progress, rediscovering and editing half written chapters. I tried to use the Smart Pen to sketch rough diagrams to attach to the written instructions but I forgot to switch it on to activate the special paper..! I enjoyed the challenge of turning my “chuck it in and see” recipes into formal instructions but I will need to get someone to check that the quantities are accurate and will produce something edible. I hope that a publisher will allow me to include some of these so the Yurt Book is more diverse and quirky than a straightforward quilt book. A few more productive days like that should get the manuscript into shape and ready for submission at last. I had a great day on the beach at St Cyrus with the children on Monday, the May Day holiday. It was sunny, not windy, lovely and warm beside our driftwood bonfire. We just sat and watched the waves, built a moated sand castle and made hot-dogs washed down with cups of tea. I didn’t even worry about my To Do List at all! I did battle with a pair of linen curtains for the next couple of days, regretting using the thick blackout interlining. There was barely enough so when the sun shines I can see that it doesn’t quite reach the top. The linen seemed to keep moving every time I measured it and I could not remember how to use the blind hem foot so I simply used invisible thread for the hem instead. After hanging them they trailed voluptuously and annoyingly on the floor so I took up yet another hem that I wasn’t pleased with. 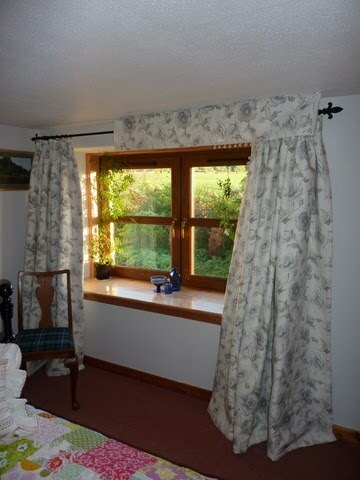 The finished curtains seemed so bulky after the 40-odd year old velvet ones that I thought they looked like bedspreads and decided that from now on I will only make Qurtains or pay a professional to do them properly. I know I should have sewn them by hand; using the machine was not necessarily faster. I am going to make a pelmet with pompoms to finish them off. Visitors declared them to be very posh so I must stop obsessing over the mistakes that only I can see. I added some painted details to the Hare but there seemed to be something missing. I thought he needed a shadow but Mo favoured a standing stone. That is the trouble with not planning something in advance. I looked up images of hares and standing stones but just could not find inspiration. In the end we have decided to cut a bit off the bottom end of the Hare panel so that he no longer seems to float in the middle and we will attempt to add on some new quilted borders with Celtic details. Meanwhile, Mo is going to appliqué a Green Man’s head so hopefully we will have a choice of panels with which to enter into the two person category at FOQ. As an antidote to all of that artistic decision making, I ran up a super simple 5-bar Amish style strippy in 2 colours of Oakshott which I intend to quilt very geometrically for a change. 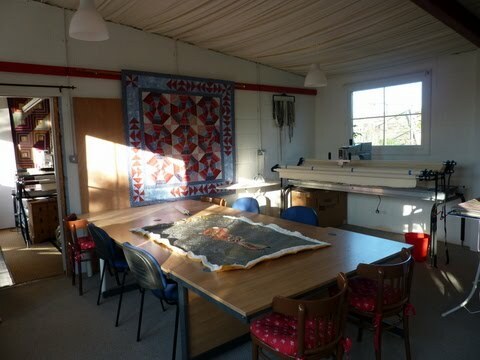 I absolutely MUST make some progress with writing so will work on that on and off during the week, while continuing to churn out quilted/corrugated Yurt roof sections and try to make a decision about dates on which I could offer classes. This weekend we went on a family outing to have a go at 10-pin bowling. I don’t think my dodgy elbow appreciated hurling the incredibly heavy bowls but I came second and enjoyed the nachos. The children became utterly addicted to the 2p pushing machines in the amusement arcade and fed all of their winnings straight back into the slots until they were broke. After a slap up supper at Costco, it was time to supervise music practice, do the ironing, organise packed lunches, read bedtime stories and update the blog at the end of yet another week that simply flew past. It was another 4-day week so I had to get stuck in and try to quilt two things at once. 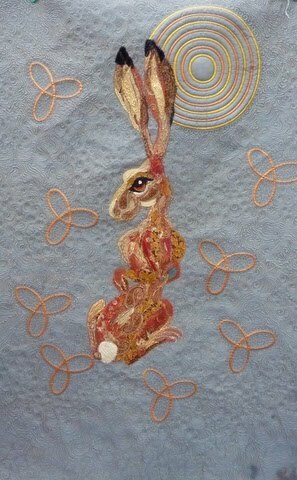 I rattled off three Yurt2 roof sections then concentrated on getting Mo’s Hare quilted. I decided to do the background first as I really wasn’t sure what to do about his body. I am pretty pleased with the effect considering that this was the first project that I had done on Lenni and I was squeezing myself into a very small gap which was not very comfortable. In the end the body was just quilted with wiggly lines as the fabric collage did not really demand anything fancier. There now needs to be some paint to enhance some quilting lines and a few sparkly crystals. Mo and I need to decide whether we are happy with the Hare just sitting there – she had originally planned to do a standing stone collage but hit a creativity brick wall with the project. I think it also needs something interesting to happen in the binding then I will send it to FOQ before it officially becomes a new Yurt panel. Since major dieting was not a speedy option for squeezing in between Lenni and Milli, I decided it would be quicker to rearrange my studio to fit Lenni in the larger room. It is a pity that I have to have the longarms in separate rooms but it is now in a much better position as Milli’s room is chilly and shady all day. I dismantled the frame and reassembled it all by myself as good practice for being at a show. I also put together the flat pack table that arrived as a replacement for my Horn cabinet so I reckon I’m getting pretty good at using my tools and even following instructions. While spending all this time in my workshop I thought a lot about running classes on a more regular basis. I have been meaning to do this for ages but never got around to writing down specifics, requirements and picking some dates. With Miche on board as an informal PA, she is giving me helpful suggestions and setting me “homework” tasks to try and get things done more efficiently. I made myself finish off an article for C June Barnes that I started over a month ago and thankfully she has approved it so I was able to tick that off one of my lists. Like most of the people in the UK, I took the day off on Friday to watch coverage of the Royal Wedding and have a picnic lunch with friends. I decided that Coronation Chicken and G&T Granitas would be delicious patriotic treats. The BBC did its usual great job of commentary and providing wonderful footage of the ceremony, procession and crowd scenes. I encouraged the children to watch such an historic event, annoying them by singing along to “Jerusalem”. We loved criticising the outfits and hats, and trying to work out who was who. It was lovely to forget about deadlines, foreign wars and disasters for just one day and be caught up in a feeling of national goodwill. This week I have to find a large box and arrange a courier to take quilts and the Smart Car cover to Loch Lomond and make some headway with the book draft and quilt class plans and make a pair of curtains… However, the children don’t return to school from their long weekend until Wednesday so that could be quite a lot to fit in!